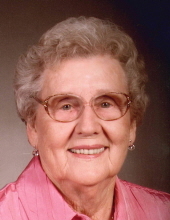 Mrs. Agnes Shoemaker Alexander, age 91 of Roaring River passed away Monday, November 26, 2018 at Wilkes Senior Village. Funeral services will be held 2:00 PM Friday, November 30, 2018 at White Plains Baptist Church with Pastor William Souther officiating. Burial will be in White Plains Baptist Church Cemetery. The family will receive friends from 1:00 until 2:00 PM prior to the service at the church. Mrs. Alexander was born April 10, 1927 in Wilkes County to Robert McKinley and Addie Mastin Shoemaker. She was a member of White Plains Baptist Church. In addition to her parents she was preceded in death by one sister; Virginia Bowman and two brothers; Edward Shoemaker and Bruce Shoemaker. She is survived by her husband; William Clay Alexander, one daughter; “Jan” Jeanette Jacob and husband Danny of North Wilkesboro, two grandchildren; Benjamin Andrew Jacob and wife Jamie of Portsmouth, VA, Peter Summerfield Jacob and wife Jada of Fort Benning, GA, three great grandchildren; Peter Summerfield Jacob, II, Tatum Lockland Jacob, Rhett Alexander Jacob and one brother; Bobby Shoemaker and wife Vecie of North Wilkesboro. In lieu of flowers memorials may be made to White Plains Baptist Church, 1432 White Plains Road, Roaring River, NC 28669 or to the charity of the Donor’s Choice. To send flowers or a remembrance gift to the family of Agnes Shoemaker Alexander, please visit our Tribute Store. "Email Address" would like to share the life celebration of Agnes Shoemaker Alexander. Click on the "link" to go to share a favorite memory or leave a condolence message for the family.